This year's Jewish Outdoor Escape event in Prescott, Arizona will be priced at $379, with prices rising in July. Registration is expected to officially begin at the end of May. This year, participants can pay a $50 deposit that will allow them to register first. This program, which begins in March, will allow participants to have first dibs on preferred housing (single or double units) along with first choice for daily event sign-ups. Look for an upcoming announcement for the launch of this program in the next few weeks. Prices and details for the pre- and post-trips have also been announced -- see below for more information. In January, the Mosaic Outdoor Clubs of America announced that the 2017 Jewish Outdoor Escape will take place Aug. 31 to Sept. 4 -- Labor Day weekend -- in the scenic, high-desert town of Prescott, Arizona. Held in a different location every year, the Jewish Outdoor Escape (JOE) celebrates the end of summer. Here, Jewish outdoor enthusiasts from all over the world enjoy nature in a free-spirited and welcoming Jewish setting. More than 100 like-minded Jewish adventurers attend these events, taking part in such activities as hiking, biking, paddling, nature walks, arts & crafts, dancing, workshops, swimming, campfires, field games, photography, swimming, cultural events and some great surprises! As always, this year's event is brought to you by Mosaic Outdoor Clubs of America (MOCA), a non-profit, volunteer-run organization with 12 clubs located throughout the United States, Canada and Israel. MOCA promotes appreciation of nature, outdoor skills and conservation while building Jewish community and continuity. For those interested in extending their time with Mosaic's Jewish Outdoor Escape (JOE), this year we are offering both pre- and post-trip events. If you have the time, this is the perfect opportunity to explore more of the southwest. Each of these trips are several days in length, and attract a much smaller crowd than the JOE -- generally up to 24 people. The pre-trip this year is called Red Rocks of Sedona. Running from Monday, Aug. 28 to Thursday, Aug. 31, this three-day event will introduce participants to Sedona, the Southwest's "energy" capital. The cost is $295. Surrounded by red cliffs and canyons, Sedona is home to a vibrant arts community, as well as dozens of hiking and mountain biking trails. It is also known for its Vortexes, believed by Native Americans to be earth energy healing centers. 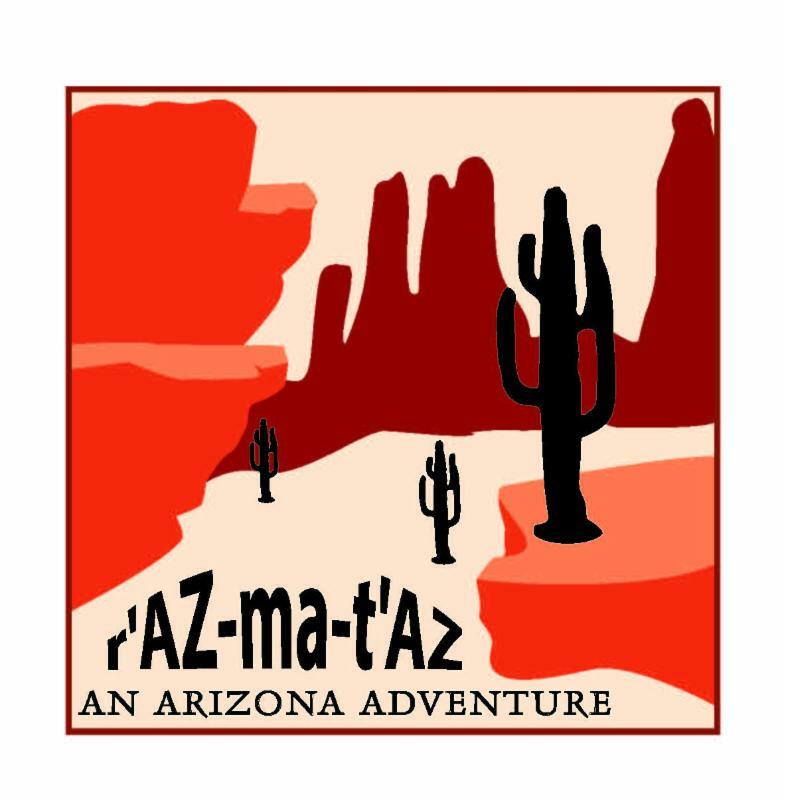 Participants will arrive Monday afternoon in Phoenix, and spend all day Tuesday and Wednesday exploring the Sedona area. There will be hikes, history tours, vortex tours and other fun daytime events, plus group activities in the evening. On Thursday, we'll have time to see more on the way to the Jewish Outdoor Escape, including a stop in the unique arts community of Jerome. We'll arrive at JOE in time for afternoon registration. After the JOE is over, the post-trip will offer the three-day Grand Canyon South Rim Tour. This three-day event gives participants an extended look at one of the world's most famous natural wonders. Guests will get to know the canyon through hiking, biking, riding mules into the canyon, or just exploring the many vantage points along the rim. The cost is $295. It begins Monday, Sept. 4, as we say good-bye to the Jewish Outdoor Escape and head to the South Rim of the Grand Canyon. 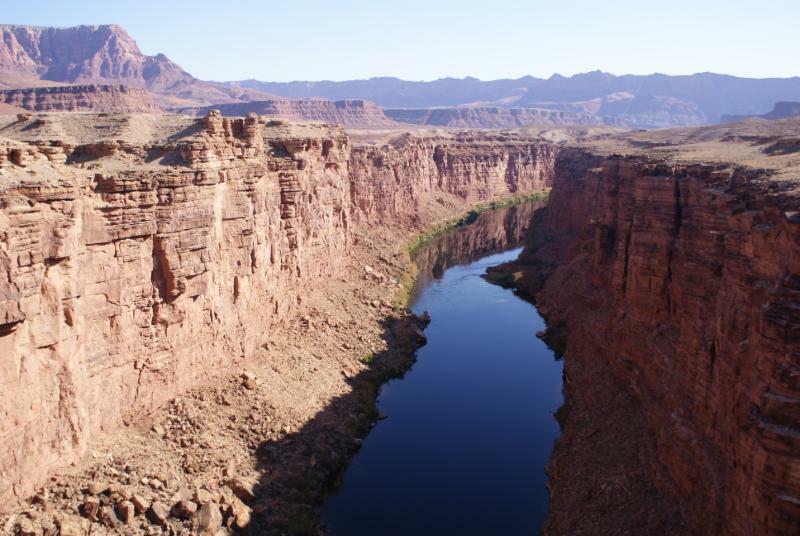 We'll have most of Monday and all of Tuesday to explore the canyon. On Tuesday, participants can choose a variety of activities (some additional fees may be required). We spend our first two nights in the Maswik Lodge, just a quarter-mile mile from the South Rim. We'll wake up before dawn on Wednesday to catch the sunrise over the canyon. From there, we head south, to discover some of the highlights of Central Arizona and Phoenix, including Little Colorado River Navajo Tribal Park, Walnut Canyon, Flagstaff, Montezuma Castle and Phoenix Sonoran Desert Preserve. You can fly out that night (late departures only, please) or stay in Phoenix and, depending on departure time, will have time to see part of the city before heading home. What makes Mosaic Outdoor Clubs of America different from other clubs? For one, regardless of our level of observance, it is our 5700-plus years of rich heritage, our Jewish Identity. To celebrate that heritage, to infuse Jewish identity and to inspire us, a couple of years ago we have started a new tradition -- we begin each MOCA board meeting with a brief D'var Torah. Every month a different board member extracts a point that speaks to them from the Torah portion of the week, and shares with the board what it means to them and Mosaic. 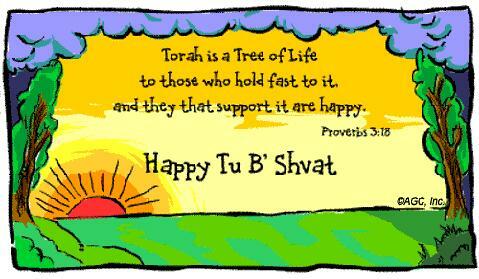 Earlier this month, we celebrated Tu B'shvat, the "New Year of the Trees." Many contemporary Jews look upon Tu B'Shvat as a Jewish Earth Day, a day for contemplating our ecological heritage. Our heritage is rich with inspiration about protecting the earth and conserving natural resources. meeting in honor of Tu B'shvat. It was so inspiring I wanted to share it with the Mosaic community. If ever there was a formal holiday of MOCA, Tu B'shvat would be it. It celebrates not just trees, but nature as well. Rebbe Nachman, a great sage of the 18th century, taught that even before saying morning prayers, one should go out and listen to the songs of nature. Mosaic members frequently live by these words. We hike through forests, paddle along rivers, and bike across trails, listening to and cherishing nature. We recognize that it is our duty to preserve this world. In Genesis it says "And the Lord God took the man and put him into the Garden of Eden to dress it and to keep it." This shows that we have a responsibility to care for the earth. On Tu B'Shvat there is a tradition to plant trees. I remember as a girl in Hebrew school, having a picture of a tree with leaves, and every week bringing in a dime to get a "leaf" to paste onto the tree. Once completed they were sent to the JNF to plant a tree in Israel. One day Honi was journeying on the road and he saw a man planting a carob tree. He asked, "How long does it take [for this tree] to bear fruit?" The man replied: "Seventy years." Honi then further asked him: "Are you certain that you will live another seventy years?" The man replied: "I found [already grown] carob trees in the world; as my forefathers planted those for me so I too plant these for my children." and an overabundance of waste -- and reduce our footprint in this world. Go eat some delicious fruit such as dates and pomegranates. Plant a tree. Enjoy the world in all its natural beauty. 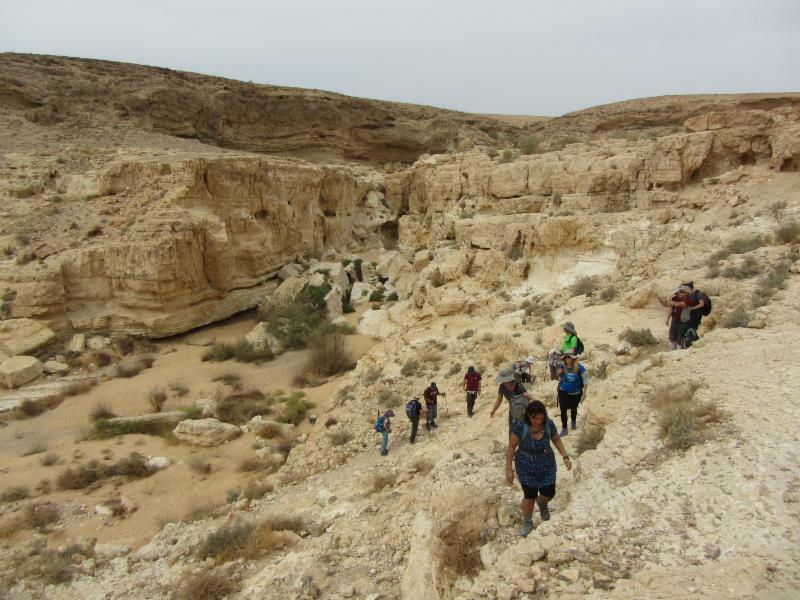 The Peres Riverbed in the Negev, a classic Israeli hike. Many members of Mosaic Outdoor Clubs of America may not know this, but there is a Jerusalem chapter that is loosely affiliated with MOCA. Founded by a former member of the Boston chapter who made Aliyah in the early 1990s, the group is called the Jerusalem Mosaic Hiking Club. 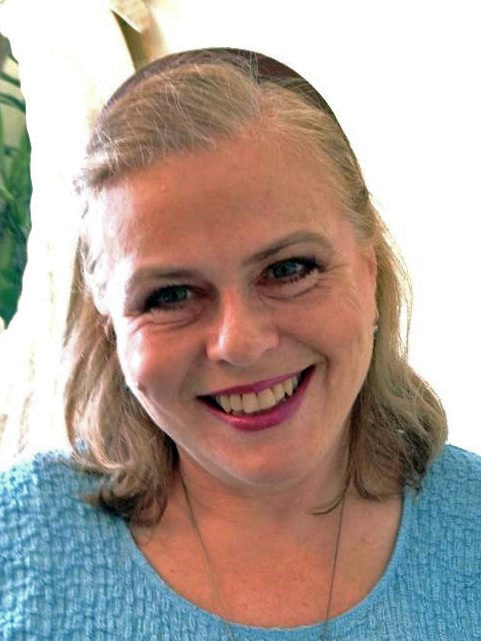 Its Facebook page lists more than 500 members, but the group's secretary, Deborah Lustig, tells Mosaic In Motion that there are about 30 to 50 active members. Lustig, originally from London, England, joined the club in 1994 and has been a member on and off since. She said the club goes on a hike once a month, with weekend trips a few times a year. Generally, the group hikes on Fridays, since most Israelis work Sunday through Thursday. Weekend trips begin on Friday and include religious observance on Shabbat. Often the club hires guides for hikes into the wilderness - trails aren't always marked, and there are a lot of them, she said. While some members prefer shorter strolls, other members are serious hikers, and Lustig said she is trying to encourage longer trips. "There's a lot to explore," she said. "We'll climb mountains, walk through the desert. Sometimes we end up jumping into a spring at the end. Next month we're doing a tour of the Old City." 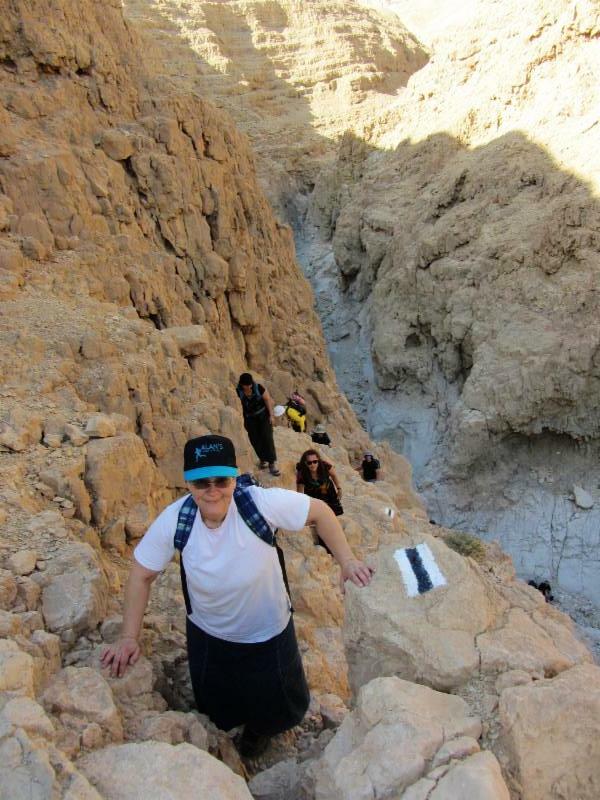 In Israel, getting to the outdoors is relatively easy, she said. "In one direction, just 20 minutes outside Jerusalem one can get into trails and interesting walks," she said. "An hour toward the desert, and you can find other trails. Nothing is very far from each other here." Walking in the Golan, just above Lake Kinneret. from the United States, Canada, England, France, South Africa, Germany and Australia, as well as the occasional Israeli. Some join only for a few years; others have remained in the club for many years. Generally, members are in their 40s to 60s. Like Mosaic chapters in North America, finding younger members has proven difficult, but current members remain loyal. English is the primary language spoken. Often, trips will encompass Israel's long history, both ancient and modern. Last year, the group hiked to a mountain known as Sartaba, which was part of a chain of torches lit in Biblical times, visible from Jerusalem to Babylon to mark the start of a new calendar month. The group has also hiked to the Fortress of Masada, and visited the Golan Heights. Recently, they also did a guided walk at Mt. Herzl, Israel's national cemetery, where many of the country's most important leaders are buried. "There's a story behind every grave," she said. 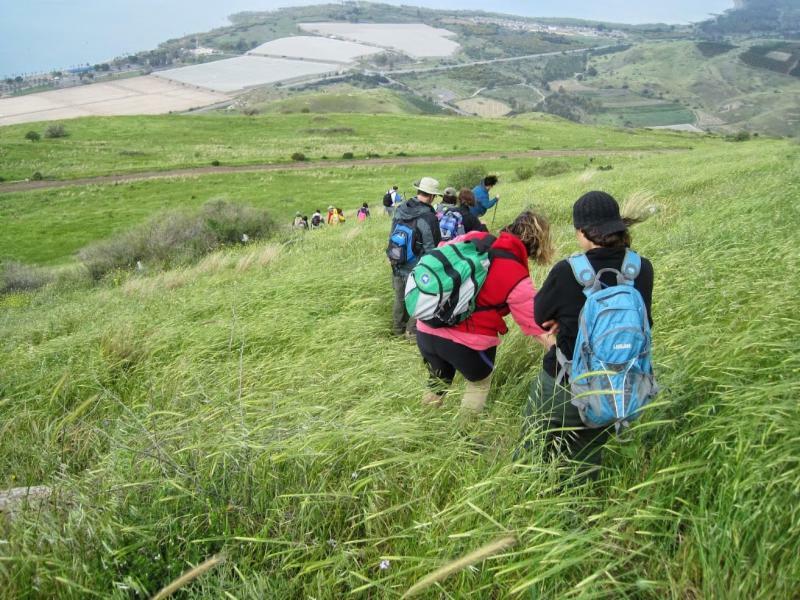 Mosaic members headed to Israel for short or long trips are always welcome to join a hike. If interested, you can contact Deborah. 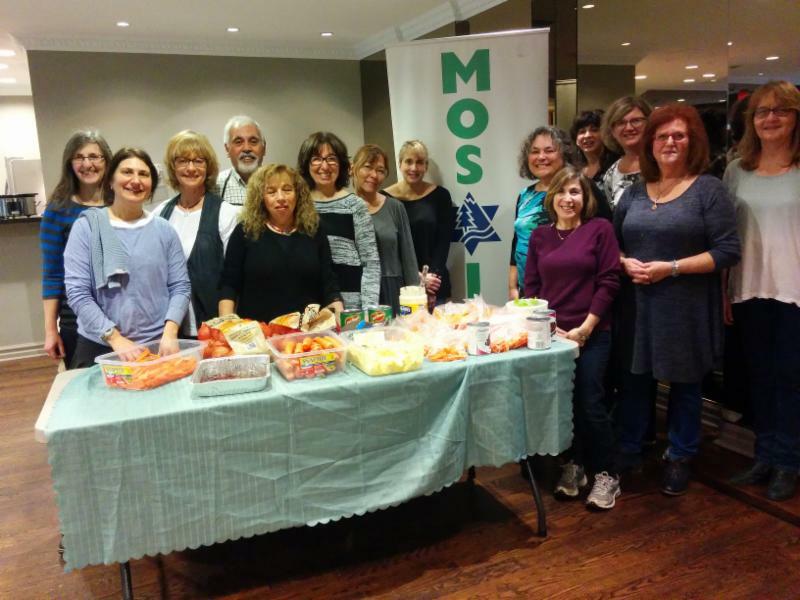 More than 20 member of the Mosaic of Ontario chapter took part in an event to feed the homeless last January. Members volunteered for several hours, making lunches of chili, spicy lentil soup, egg salad sandwiches, carrot and celery sticks and brownies. The food was made for the Jewish organization Ve'ahavta, which operates a van that travels the streets of Toronto to provide food for those in need. Each Mosaic participant contributed $10 as well as their time to further the group's efforts. Other Mosaic chapters from around North America are welcome to submit examples of their charitable work or other events for inclusion in future newsletters. Send information to editor Alan Wechsler. 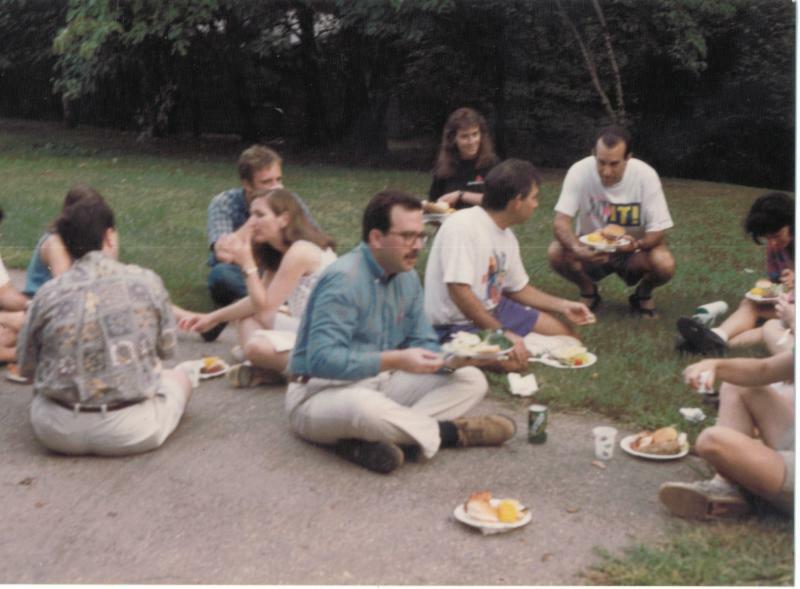 Editor's note: In the first two chapters of Mosaic's history, we read how Dr. Steve Millmond moved from Seattle to Denver in 1988 and wanted to bring outdoorsy Jews together. After creating Mosaic in Denver, he moved east and created chapters in Maryland and Philadelphia. As the group grew, talk began about bringing members from different chapters together for an annual event. 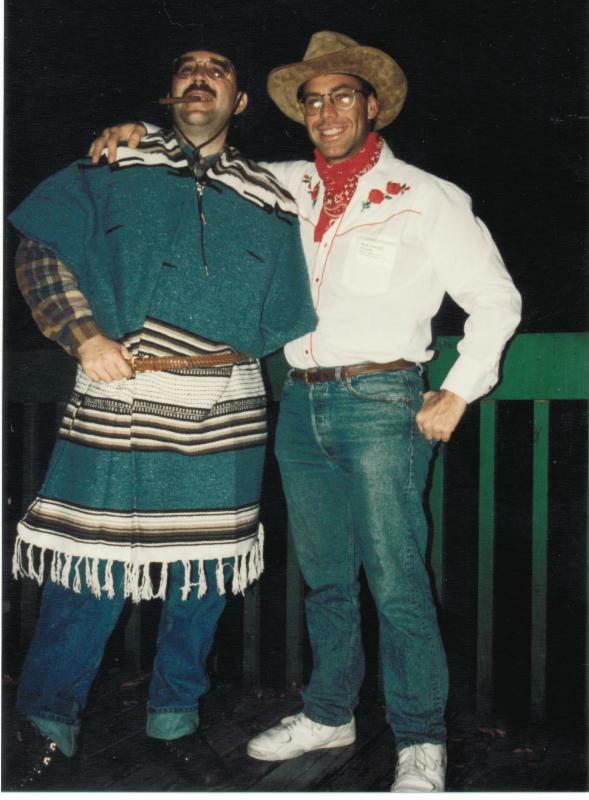 Mosaic pioneers Steve Millmond (left) and Rick Dronsky, 1994. The first Mosaic annual event was held in 1991 in the Rocky Mountains of Colorado. It was a joint effort by three chapters - Colorado, Boston and Atlanta. The next year an expanded event was held in Vermont, and a year after that in Georgia. By 1993, it was a tradition for a chapter to host a national event. About this time, Rick Dronsky, an entrepreneur from Miami, heard about a planned Mosaic event in Georgia. He thought it sounded fun. He attended, went back home and quickly formed Mosaic Outdoor Club of South Florida. Dronsky would quickly prove a pivotal player in the growth of Mosaic. "I came home and I loved the concept. I wanted to start a club, so I started the South Florida club," Dronsky said. "Nobody stepped forward to do the fourth (national event), so I said, 'all right, I'll do it.'" So for the fourth event, the South Florida club hosted the national event in North Carolina. After that, the idea was raised to get chapters to combine their effort on a national event, so one chapter didn't have to shoulder the full burden each year. Thus, a National Event Committee was created to put together the 1995 event in the Poconos of Pennsylvania. 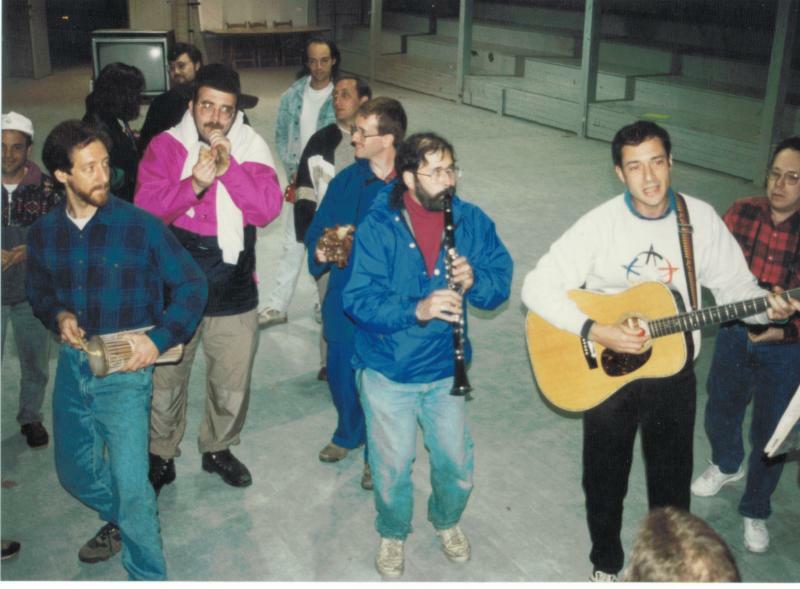 That year, Myron Katz, the founder of a Mosaic chapter in Louisiana, provided a valuable benefit to the club. There was this strange, new thing that people were talking about, and he knew Mosaic needed to be included. The thing was called The World Wide Web, and Myron built Mosaic's first web page. The site, once launched, had information and contacts for all the Mosaic chapters. With a few keystrokes, outdoorsy Jews around the country could find their closest chapter. It was also in 1995 that a new, national umbrella group was announced to run the national event. It would be called Mosaic Outdoor Clubs of America, or MOCA. "It was a big, uphill battle to get clubs to buy in," said Rick. "They thought they'd have their rights taken away, like state rights vs. federal rights. It was a long road." so outraged his face turned almost purple, and it looked like he might have a heart attack. All for what was meant to be a rather innocuous concept. "The main focus was to provide an ongoing repository of information and education to provide to the next club to lead the next national event," Zellner said. "Each club was reinventing the wheel, making the same mistakes over and over again." With MOCA, a new governance was in place. And the organization began to expand in all sorts of ways.